A wonderful ground cover plant, Thymus longicaulis or creeping thyme as it is often called is useful in many parts of the garden. Originally from the Mediterranean where it grows in rocky areas, we grow this useful plant along the edges of garden walls as well as in the general garden border. 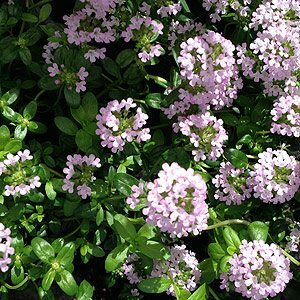 This is a prostrate thyme with attractive glossy green foliage and masses pink flowers that look like little buttons. Originally from Greece this a drought tolerant sun loving plant that requires little care once established. Useful for underplanting and will reach a height of around 10cm (4 inches). This is a mat forming plant that will spread quickly, yet is easy to control. Very tolerant of a range of soils from dry to moist, however not waterlogged. Ability to grow in full sun to part shade make this a versatile ground cover. This is also a wonderful plant for attracting bees to the garden, when in flower it is really a ‘Bee magnet’. Thymus longicaulis subsp. chaubardii – similar to the species with perhaps more pink in the flowers. A sunny to part shaded position in a humus rich well drained soil is best. Thymus longicaulis or Creeping Thyme will also grow well in containers where it provides an interesting carpet effect, along with fragrant foliage. Use a slow release fertilizer in spring or perhaps a liquid seaweed fertilizer in spring and again in summer. Plants can be pruned back to maintain size and control spread. Botanical Name – Thymus longicaulis. Common Name – Creeping Thyme. Origins – Greece and nearby areas. Height – To around 10 cm. Foliage – Small fragrant and deep green.